Pro-Ject reveals vertical, wall-mountable turntable concept | What Hi-Fi? The turntable can be placed horizontally, vertically or even on the wall, all the while still capable of spinning your vinyl, allowing it to be as much a work of art as a record player. The VTE is based on the Pro-Ject Elemental turntable, which is designed to be a basic plug and play design. A belt-drive deck, it has had the tracking force and anti-skate adjusted so that it can work against gravity when placed vertically. It comes fitted with an aluminium tonearm and Ortofon OM53 cartridge. Pro-Ject has also made a second version of the VTE that’s fitted with a phono pre-amp and Bluetooth transmitter for playing records through wireless speakers and Bluetooth connected hi-fi systems. The VTE is currently just a concept design and sources tell What Hi-Fi? that consumer reaction will influence whether it ever gets made and comes to the UK. So do let us know what you think in the comments below. 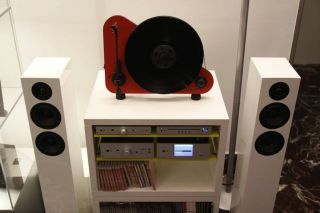 It's not the first vertical record player we've seen, with Gramovox and Toc releasing their own designs last year. We also saw turntables with Bluetooth transmitters fitted at this year’s CES, such as the AT-LP60BT from Audio Technica and the Sony PS-HX500.